CMCP525 Acceleration Transmitter Reliability Direct, Inc. Your Direct Source for Reliability, Maintenance, Test & Measurement! 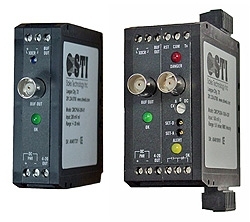 The CMCP525 Acceleration In/Acceleration Out Transmitter is available in either "Peak" or "True RMS" signal detection versions. The CMCP525 is compatible with all voltage output accelerometers, and provides a 4-20 mA output proportional to the overall measurement. Each unit provides constant current power for the accelerometer, checks for faults, processes the vibration signal to determine overall amplitude, and outputs a 4-20 mA DC current that is proportional to a user selected range of 5, 10, 15, 20 or 25 g's with a 100 mv/g Input. CSA and UL Class 1, Div 2, B-D Approved. Alarms relays and trip multiply are available with the Monitor version.